What does Donald Trump think of today’s turn of events that’s seen his most prominent adversaries installed in some of the most powerful positions in government? Thus far he hasn’t tweeted anything about it, which tells us a lot. 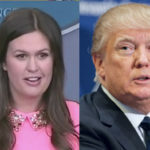 But Trump couldn’t keep his mouth shut entirely, so he had Sarah Huckabee Sanders schedule a last minute press briefing – and then Trump showed up and crashed it. Donald Trump showed up in the middle of the press briefing and meekly congratulated Nancy Pelosi on becoming Speaker of the House, while repeatedly referring to it as “tremendous.” Trump then went on to (delusionally) predict that he’ll work with the Democrats to pass all kinds of legislation, even as he ignored the reality that the House Democrats are going to quickly expose every last one of his criminal scandals until he’s ousted and given a one way ticket to prison. Trump ended up leaving the press conference without bothering to take any questions, which was telling in and of itself. He looked somewhat shellshocked the entire time he was speaking, as if he couldn’t believe the Democratic takeover was happening, and he had no fight left in him. He made a fool of himself by coming off as so tepid; he’d have been better off not to have shown his face today at all. We’re not saying that Donald Trump won’t revert back to his old patterns and begin dishonestly attacking Pelosi and the House Democrats by tonight or tomorrow. But it says a lot that his initial reaction to today’s events was one of resignation. Now we get to watch the Democrats try to steer him toward an actual resignation.